When another driver causes your automobile accident, you may be tempted to not even report the crash to your own insurance company. After all, the negligent driver is responsible for compensating you for your injuries. While this is true, there are many reasons why you should report your accident to your insurance company. If you fail to do so, you may find later that you are unable to obtain important benefits through your own insurance policy. Contractual duty. Your insurance policy is a contract between you and your insurance company. It most likely has a provision requiring you to notify the company within a certain amount of time of your accident. If you fail to do this, you could be in breach of your contract. Repairs. You may find it easier to file a claim for the repairs to your vehicle and for a vehicle rental while the repairs are being completed with your own insurance company. The insurance company for the negligent driver may dispute that its driver was at fault or that you suffered as serious injuries as you claim. While you are negotiating a final settlement with his insurance company, his adjuster may not be willing to authorize payment of your vehicle repairs or a car rental. It could take months or longer to reach a final settlement. If you are like most people, you need your vehicle repaired quickly and filing a claim with your own insurance company could become a better option. Policy requirements for filing a claim. Your insurance policy will require you to report your accident within a certain number of days in order to file a claim for compensation. Even if you do not plan to file a claim with your insurance company initially, you may find it necessary later after you begin negotiations with the other driver’s insurance company. If you failed to report your crash within this contractual time limit, you may lose the right to file a claim if you later discover you need to. Other driver’s policy inadequate. While the other driver may provide you with his insurance company’s contact information at the accident scene, this does not mean he has coverage. For example, his policy may have been cancelled if he failed to pay the premiums that were due. In addition, his liability insurance coverage may be insufficient to fully compensate you for your injuries. In Georgia, a driver is only required to purchase $25,000 in liability insurance for one person’s injury or death—often not even enough to pay an injured victim’s medical bills. In either of these situations, you may need to file a claim under your own uninsured or underinsured policy if you purchased this additional coverage. Even if you have never filed a claim under your own insurance policy before, you cannot assume that pursuing your claim for compensation for your injuries with your own insurance company will be any less challenging than with the negligent driver’s company. You could face the same arguments as to liability and the seriousness of your injuries. That is why you need to be very careful in discussing your claim with your own insurance adjuster. An experienced car accident attorney will give you valuable advice on reporting your claim and assist you in negotiating your settlement with your insurance company if this becomes necessary. 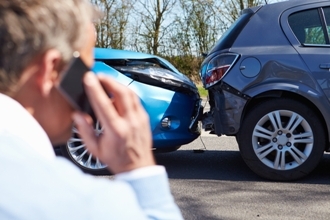 Were you or a family member injured in an auto accident caused by another driver? Contact us online today or call us today at 888-795-6261 to schedule your free case evaluation to learn about your legal options. Feel free to download your free ebook "Understanding Georgia Automobile Accident Claims", a valuable resources filled with information you need if you've been involved in a car accident.